In modern-day Paris, one can find no trace of les Innocents church or cemetery in their original location, instead finding the area of les Halles a shopping complex surrounded by restaurants and fast-food joints. The bones from the original cemetery can now be viewed in the Catacombs (along with bones from other destroyed cemeteries aross the city), the entrance to which reads 'Arrête! C'est ici l'Empire de la Mort.' (Stop! This is the empire of the dead., or something along those lines based on my college French lessons). All of this is noted in Andrew Miller's author's not in Pure, his sixth novel, which centers on the dismantling and emptying of les Innocents. The result is a delightful if haunting and eerie tale of 18th century Paris, a city on the cusp of revolution. Jean-Baptiste Baratte, a pseudo-successful engineer with big dreams of bridges and collonades, has been tasked with removing les Innocents from the city, sweeping out the scourge of death that lingers over the graveyards. Baratte sets at the task with the mind of a modern man unencumbered by notions of the past and of traditions, but the power of the cemetery is no so easy to shrug off. Miller's novel is carefully layered and extravagant, bringing to life a Paris we wish we could still visit today (though perhaps without some of the pervasive stink of the cemetery so notable in Pure). 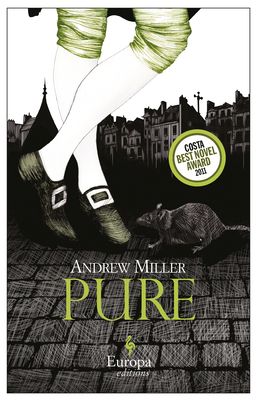 Though the French Revolution has captured our imaginations for years, with the likes of Les Miserables permanently entrenching the time in our imaginations, Miller turns back the years and focuses on a time slightly before the more famous decade of the 1790s, capturing a city suspended between past and present, tradition and modernity, religion and philosophy in a way that will leave readers craving more of Miller's work--hopefully Europa will be kind enough to bring more of this to the US in the future.